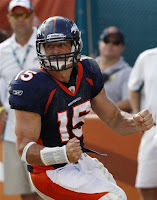 AW: I am so Thankful for Athletes and Men of Faith like Tim Tebow. What a role model to young boys and all youth, and especially to those who come in contact with him and other athletes like him. We need to pray for his continued witness in the NFL and all who are watching. I have used videos of his mission work in the Philippines with children in teaching our youth at church, and continue to be blessed by all that he does.